US President Donald Trump on Wednesday revealed that he received a “great letter” from North Korean leader Kim Jong-un. 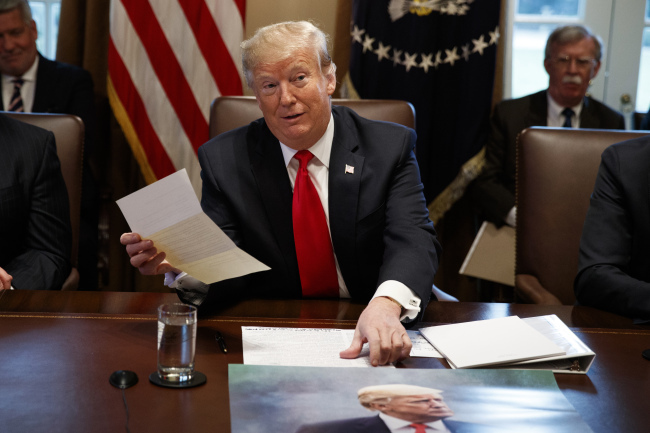 Speaking at a cabinet meeting, Trump said that he received a letter from Kim, and reiterated his belief that North Korea is seeking real changes, and once again stressed his part in North Korea-related developments. Claiming that his meeting with Kim in Singapore on June 12 prevented a “big fat war” in Asia, Trump said that North Korea wants changes. Trump, however, did not provide any hints on the second summit with Kim saying only that he is “not in any rush” to hold the meeting, which he has said will be held early this year. Despite Trump’s repeated statements regarding his relationship with Kim, which he once compared to falling in love, little progress has been made since the June 12 US-North Korea summit. In contrast to Trump’s public display of confidence, US national security adviser John Bolton has suggested that the US president’s plans for the second summit are motivated by the lack of progress. Working level talks between Pyongyang and Washington have failed to produce any real results regarding denuclearization, with both sides unwilling to give concessions. Pyongyang continues to demand that the US take measures corresponding to steps it has taken, while the US has reiterated time and again that sanctions will remain in place until denuclearization is verified. Due in part to lack of progress, even South Korea’s conservatives, usually staunch supporters of the US and its leaders in North Korean matters, appear to be growing skeptical of Trump. Speaking at a forum held Tuesday, conservative main opposition Liberty Korea Party’s Rep. Kim Moo-sung claimed that Trump should not be trusted, claiming that the US nuclear umbrella is the only deterrent against the North Korean nuclear threat. North Korea, meanwhile, may be seeking means to offset uncertainties arising from its dealings with the US. In a report released on Wednesday, Seoul’s Korea Institute for National Unification said that Pyongyang may be becoming more accepting of inter-Korean agreements, while hedging its bets. The Panmunjom Declaration signed at the April 27 inter-Korean summit states that the two sides will seek three- or four-way peace talks. A three-way talks will involve the two Koreas and the US, and the four-way talks would include China. North Korea, however, had maintained that a peace talks is a matter for discussion with the US. “From North Korea’s point of view, it is highly likely that a multilateral negotiation was suggested as a mechanism to buffer against uncertainties in US-North Korea negotiations,” the report said.